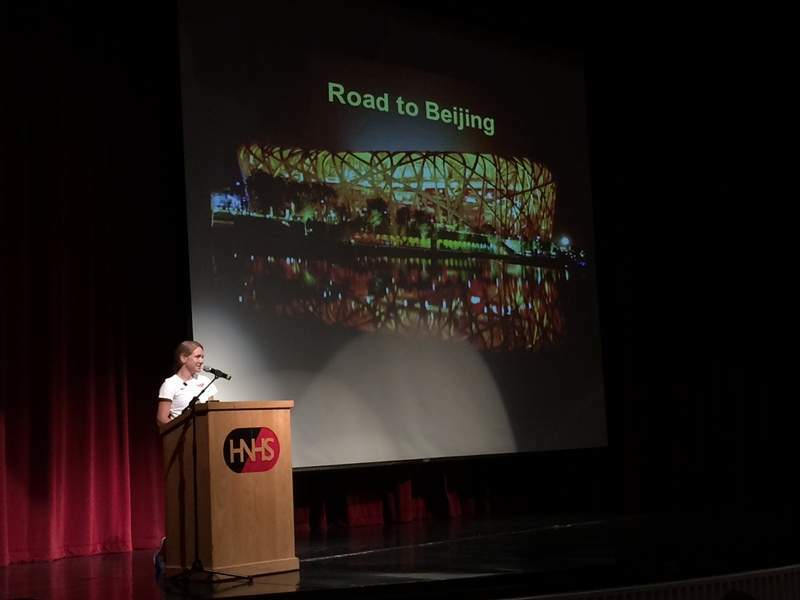 Aubree Reichel | The Journal Gazette Huntington-native Lauren Johnson addresses a crowd at Huntington North about her experiences in Beijing and in the world of professional running. Johnson finished 13th in the semifinals of the 1,500-meter run at the world championships in August. 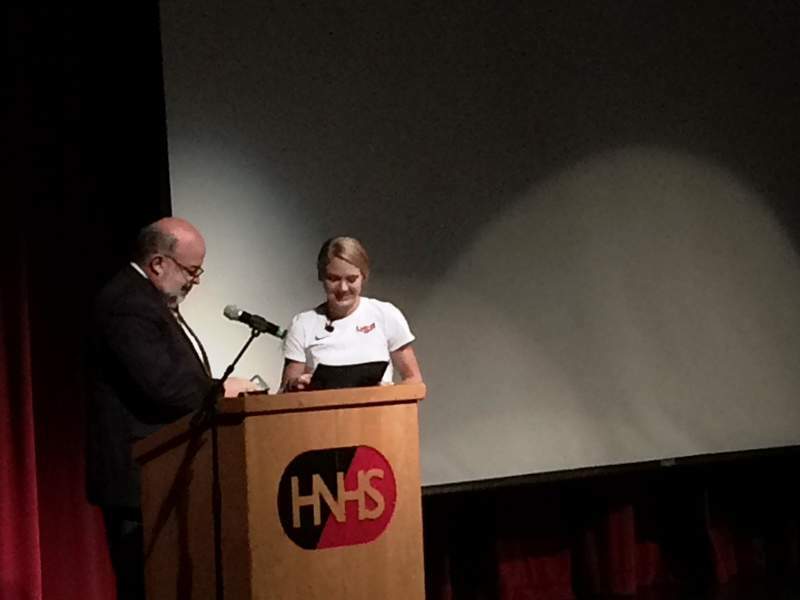 Aubree Reichel | The Journal Gazette Huntington Mayor Brooks L. Fetters presents Lauren Johnson with a signed proclamation at Huntington North on Thursday. The proclamation made today Lauren Johnson Day in the city. HUNTINGTON – Professional runner Lauren (Davenport) Johnson knew she was going to address a crowd in her hometown at Huntington North High School on Thursday evening. What she didn’t know was that Huntington Mayor Brooks Fetters was to sign a proclamation that today is Lauren Johnson Day in Huntington. She was also given a medal of leadership by the mayor. "It means a lot to me," Johnson said of the support. "Being from a small town and having the community supporting me, having family and friends here, some past coaches I haven’t seen in a while came. "It’s really cool. Maybe wasn’t so up for the public speaking thing, but getting everybody together, getting to see everyone was good." The proclamation and gathering was aimed at recognizing Johnson’s recent achievements of advancing to the semifinals of the 1,500-meter run at the IAAF Track and Field World Championships in Beijing in late August. She missed the finals by 0.82 second, finishing in 13th place. "In the last 100 meters, there was nothing I could do," she said. "On my road to Rio, I plan to change that and get stronger aerobically." Among those in attendance were Huntington University track and cross country coach Tom King and Huntington North boys cross country coach Curtis Hines, who has maintained a friendship with Lauren and her husband, Nick. "You have a girl from Huntington, Indiana, that has gone up against incredible odds to make a world championship team," Hines said. "It’s just been challenging as an athlete who focused on basketball most of her life; she’s behind a lot of other women that she’s competing against. "Women who were primarily runners that ran at high-mileage Division I programs and she got started in the sport later than all of them and she’s competing against the best 1,500-meter runners in the world. It’s incredible what she’s been able to accomplish." Since the world championships ended Aug. 30, Johnson has been enjoying time off from running to visit friends and family before her next training cycle begins today. "It’s been great to have some down time," she said. "I’ve taken time off of running to get recovered, to get ready for next season. Having time to spend with family, time to spend with friends has been really good." She addressed the crowd in the high school’s auditorium, talking about where she got her start with basketball, running and a variety of other sports and how it led her into pursing the world of professional running at 22. The idea of doing multiple sports before specializing has seen a decline, but Johnson encouraged the parents of young athletes to keep their kids from specializing on one sport too soon. "Don’t be afraid of trying multiple sports," she said. "Try different things and find what you like and what you’re good at." Johnson also addressed the importance of a proper diet and fueling for athletes and mental preparation. With the world championships and her recovery period finished, Johnson has set her sights on training for the 2016 Olympic Trials, which are scheduled for July 1-10 in Eugene, Oregon. She has to finish in the top three to make the U.S. Olympic team. "Fourteen women have already hit the qualifying standard for the 1,500," she said. "That’s the most in history. I can’t control what happens with injury or what happens in the race, but I can control what I do in training."